According to the National Association for Music Education playing a musical instrument can help build a students pride and confidence, and all music students develop better communication skills than their peers. 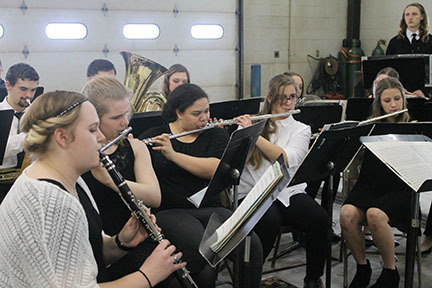 Wednesday, February 21, Valley Heights took 24 students to the TVL Music Contest. Four Vocal Entries and fourteen Band Entries made a full day of competition for the students. The Mustangs brought home 7 I ratings, 8 II ratings, and 3 III ratings. “Getting a I rating at TVL Music was so exciting, and the advice the judge gave me has been really helpful and I hope to get a I rating at Regionals,” first year TVL competitor and freshman, Sophie Brungardt. A complete list of ratings from the competition can be found below.